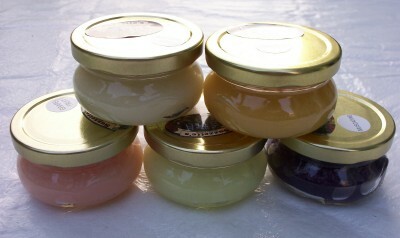 In order to continue to bring you quality and variety, we sometimes discontinue scents and/or products. You will find great quality at great prices in this section. There are no backorders for this section. Quantities are limited. Once it is gone, it is gone!Wedding favors and wedding gifts at great prices! A bargain hunter's paradise! 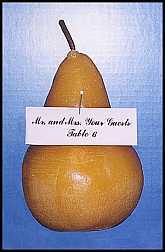 "Perfect Pair" Pear Candles These are excellent keepsake candle wedding favors! These candles are not the miniature pear candles. The standard color is golden yellow. If you would like one of the other 8 colors, you must order a minimum of 60. 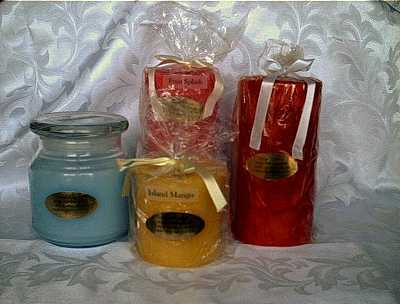 If you want to order a special color not listed, the minimum is 200 candles. These candles are 4" tall and burn 20 hours! They are lightly spiced pear scented. These candles would also make great place card holders. ONLY THE GOLDEN YELLOW IS ON SALE. IF YOU WANT OTHER COLORS, PLEASE LOOK IN THE CANDLE WEDDING FAVORS SECTION. "Perfect Pair" Silver Plated Salt & Pepper Shakers - BB These little "perfect pair" pear salt & pepper shakers are the unique items that you were looking for. They are 2.25" tall and come in a clear box. Just Perfect for "the perfect pair" wedding favors! Discontinued. Only 7 sets left. Cathy`s Concepts Car Flags These are great flags for the bride and groom to parade around town with. Let everyone know the great news!!! "Just Married" These flags are sold in pairs. These flags are already reduced. No further discounts apply. Chocolate Body Frosting If you just want to try out the chocolate body frosting, order an individual jar. Don't forget the brush! And a little imagination. These fun felt shoes are perfect for just about anything that has to deal with females. The felt shoes have a hook on the bottom so that they can be hung on the wall. The shoes are very flexible so they will bend to fit on different walls or deco. The felt shoes can be used a placecard holders or centerpieces. Since they are felt, you can stick pictures on them. The felt shoes are also a really nice size. 8"L x 3"W x 3"H Price is per set of 6. 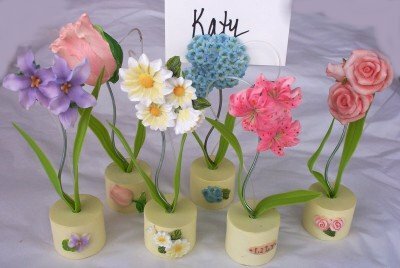 These cute resin and plastic flower placecard holders are perfect for garden or outdoor events. The flowers and base are resin. The leaves are plastic. A magnet holds the bloom to the base. You just slide the placecard between them. 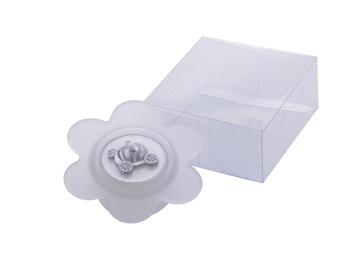 Price is per 6 assorted flower place card holders. 5.5"
Handmade Luxury Body Bars-Discontinued Scents These magnificently beautiful 8oz luxury bath bars are all natural, gentle, and moisturizing to the skin. 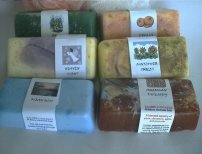 These soaps contain herbal and flower botanicals both in whole, crushed, and powdered form. Over time these botanicals release their own oils and essences, which along with the natural essential oils and fragrances, jojoba oil, coconut, olive, and palm oils, and vitamin E, enhance the healing and cleansing power of the soap. Please be careful, too much lather and moisture may spoil you forever! You can't imagine how much lather these soaps create! Oh yea, did I mention that they are beautiful also? These make great gifts for yourself or a friend. There are so many fragrances to choose from. 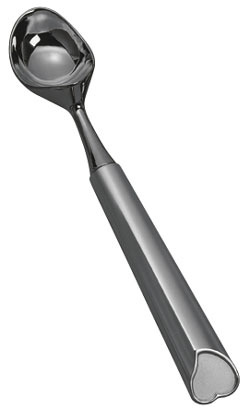 Heart Ice Cream Scooper - BB The heart shaped ice cream scoopers are a great favor for bridal showers with a nostalgic theme. These are also great for ice cream parties also. They are just too cute to pass up. 9" Price is per scoop. Discontinued. Only 9 assorted round and heart handle scoops left. 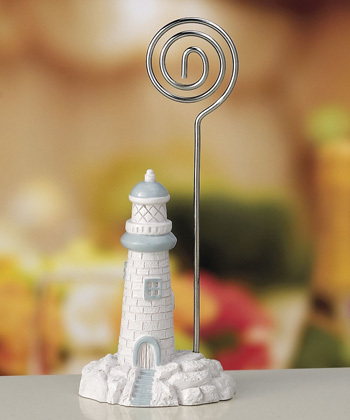 These resin lighthouse place cardholders are perfect for beach weddings. You can use them as placecard holders and as beach wedding favors. Your guests can take the lighthouse place card holders home and use as photo holders. Each measures ~4"tall. Price is per set of 12 of lighthouse placecard holders. Placecards are included. Minimum order is 3 sets. These cute pumpkin coach tea light candles are so cute. They are perfect for fairy tale wedding favors. The pumpkin coach tea light candle is in a glass candle holder. Each is packaged in a clear box. ~ 2"D Price is per candle. Minimum order is 20 candles. These are discontinued. We only have 58 pieces left in stock.